'Champions,' 'Jessie' actress says she is "ready to be free." We are on a journey of self-discovery throughout our lives. Nowhere does this seem to be truer than during the turbulent times known as adolescence. Kids go through a tremendous amount of growth, both physically and cognitively, and through it all, there's a tremendous pressure to be successful, know what you want to be when you grow up, and get into a great school so that when all is said and done, you can go off and be a great adult one day. 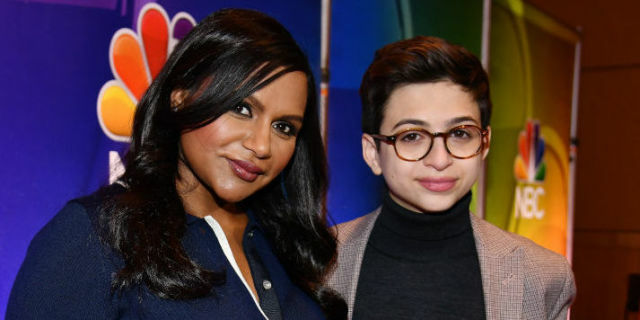 I couldn't imagine having to deal with those pressures as a teenager today in addition to realizing you're transgender and trying to navigate that, yet Josie Totah—perhaps best known for her roles as Mindy Kaling's son on Champions and as Stuart on Jessie—has done so in a very positive, movingly honest essay. Totah recently received the Human Rights Campaign's Visibility Award at a dinner in Salt Lake City, UT and has said that while he was frequently identified as a "gay boy," he would often correct people and explain that he identified as LGBTQ. That changed with her Time essay, released on August 20, 2018. While the image associated with the article is a production still from Champions, as Totah wanted the article to focus on what she was saying rather than her current appearance, it's clear that she has no ambiguity about how she identifies and how she feels about those who may or may not want to join her on her journey. "I’m ready to be free," she writes. "So, listen up y’all: You can jump on or jump off. Either way this is where I’m heading. My pronouns are she, her and hers. I identify as female, specifically as a transgender female. And my name is Josie Totah." Totah cites the TLC docuseries I Am Jazz as a huge influence on her and credits her mother for the support she's given to Josie's decision. What's interesting is how unflinchingly Totah talks about her fears prior to and after her coming out. She recognizes that there was the possibility she would not be accepted and her coming out as transgender would cause embarrassment. She even acknowledges that those who recognized her from Jessie might even be confused; the fanbase for a show like Jessie hovers around the 9 to 16-year-old range, and while preteens and teens might have little issue accepting or understanding what it means to be transgender, some might indeed experience some confusion about Totah's coming out. However, it should be noted that it's because Totah is a recognizable performer that she has now become a role model for other teens who might be struggling with their gender identity. She is now 17 and college-bound, which means that there are other teens who could connect with what Totah has experienced in a very real way. While not everyone may have been a fan of Champions or of Jessie, she has been an active presence on the entertainment scene for some time. As such, she's someone that a teenager can look to as someone who came out as transgender and continues to thrive, as Jazz Jennings, Laverne Cox, and Janet Mock, among others, have done. It's not an easy road, to be sure, but if her Twitter profile is anything to go by at these early stages, Totah has come out to a community of family, friends and fans who have her back. Totah also has acknowledged some significant fears in her coming out. "Identity documents can be hard for transgender people to change," she says. "I’m afraid of that moment when someone looks at the ID, looks at the photo, looks at the gender marker—looks at you. I never want to feel like I’m not allowed in somewhere because of who I am. I’m scared that being transgender is going to limit me in that way. And I’m scared that I’ll be judged, rejected, made uncomfortable, that people will look at me differently." In recognizing those fears, though, Totah has given a voice to the same fears that many transgender individuals no doubt have and experience on a daily basis. She's about to embark on one of the most significant journeys a teen can experience—that of college—but she's already embarked on a journey of self-discovery that seems to have given her a clarity and a strength that she should be applauded for. "It’s a clean slate—and a new world," she says, and I can only imagine just how freeing that realization must be for her. The Repercussions of 'Batman v Superman: Dawn of Justice' Continue! Sean Gunn Reveals The Beginning Of 'Guardians Of The Galaxy Vol. 2'! Scarlett Johansson's Competition: The Seven Women Who Almost Became Black Widow! 10 Times Superheroes Went Bad! Exclusive Interview With Linda Louise Duan — Tina Minoru In 'Doctor Strange'!